Hozelock Cyprio Cascades are a well known world leader selling in hundreds of thousands each year. They are available in a wide variety of sizes from the 450, for ornaments, to the 7000 which can power a fountain, waterfall, ornament and filter at the same time. Fountains - they all come complete with a selection of distinctive spray fountains (except Cascade 450i and 600i) and the Cascade 600 to 4000 with a bell jet. Waterfalls - the Cascade 1400 will give a good small waterfall and the 7000 will give a torrent. Cascades from 1400 up come with a flow controller that enables them to be used for two purposes at the same time. Filtration - water can be pumped to a filter and back to the pond, direct or down a waterfall. Filtration will be more effective if a Titan solids handling pump is used. All Cascades have unidirectional rotation with Hozelock's patented one way rotation system to maximise pumping efficiency. Mid range Cascades with the new UBI multi blade closed impeller and OMC motor design provide unparalleled performance with low running costs - 4000 lph with 40 Watts power consumption for the Cascade 4000. All Cascades from 2000 upwards are unique in using TRF technology to protect the motor from damage. If the pump becomes blocked, this solid state technology switches the motor off until power to the motor is disconnected and the blockage removed. All Cascades from 1400 upwards use a ceramic shaft and bearings for extra life. The 2000 - 4000 pumps use FCT to reduce wear and shock loads. These features allow us to offer a 3 year guarantee with confidence. 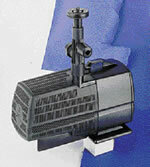 Easy to clean, anti clog, foam free strainer greatly increases maintenance intervals, Cascades from 2000 upwards. When cleaning is required, tool free access and quick release hose connection keeps this simple. For improved in pond stability, the mid range Cascades have an ultra low centre of gravity and wide base. extension tube, 2 fountain heads, bell jet and a quick release hose connector. now range from 600 to 4000 litres per hour, with the addition of the Cascade 4000lv.  The mains connection to the transformer is remote from the pond.  All LV pumps come with 3m of cable, which can be simply extended up to 50m without loss of performance. This cable need not be buried and protected, greatly simplifying installation.  Click connection for LV supply is simple and reliable. garden lighting systems allows a single light to be added to the pump supply.  Identical features and accessories to the mains Cascades.